It's the beginning of the new year, and after the holiday season has left your shelves bare, it's important to start thinking about what new toys you want to bring in to your store. Below, see our 6 retailing tips for finding new products and following toy trends throughout the year, so that your store will always have the best assortment of products to suit your customers' needs. Toy manufacturers often present their toys to prospective buyers months before they will be available. Attending trade shows, like Toy Fair in New York, can give you a heads up as to what toys are going to be hot all year long and into the holiday season. It happens every year — for a few short weeks major media outlets feature bits about the most buzzworthy products at Toy Fair. If you can't attend the show, or if actually being on the floor was too overwhelming to get an idea of the overall trends, watching Toy Videos can help you key in on the "next big thing" that was featured at the show. Make note of toys that are featured on network TV, on talk shows or news segments. These toys often end up getting much more exposure than other toys at the show, and the increased consumer awareness of the product makes them more likely to be hits. Mass-market toy and game manufacturers have a strong influence on the toy market overall. By specifically researching the products they are sharing at the Q1 Trade Shows, retailers can get an idea of what trends are likely to trickle down to the rest of the market. If you don't carry mass-market products, try to single out the most innovative or impressive elements of these top-sellers, so you can keep an eye out for similar specialty alternatives. Understanding your customer base is essential to finding toys that will be a success in your store. What sells well at a store in a resort town that's busiest in the Summer months won't necessarily have the same best sellers as a store that's open year round. Keep in mind that your customers are coming into your store, as opposed to a big-box, for a reason. You could very well have a hot selling toy that can't be found at a mass-market store — because your customers are specifically looking for high-quality specialty toys. For instance, "a lot of customers don’t want computer-based toys. That’s why they come to our stores," Bruce Beck, former owner of BJ Beck’s Toys in Cedarburg, Wis., shared with TDmonthly. "Our customers want toys that use imagination, not electricity." Take a day or an evening and go visit other stores in your area, even the big-box ones. Watch what people pick up. Watch what the kids go for. Pay attention to high-traffic displays and end caps. Is there anything interesting that you haven’t seen yet? You can also sign up for a membership or join the mailing list on competitors' Web sites, so you'll be alerted to special promotions, sales and events. "You'll know what they’re doing," and which products they are heavily promoting, advised customer diversity expert Rich Kizer. "Twice a year, instead of simply reordering the same old thing, I would call up my main inventory supplier and ask them to tell me what their top-selling items were. It beat going through their catalog and guessing what others might want. In 20 minutes of phone time, I’d have a fresh new inventory selection," Adeena Mignogna, entrepreneur and business writer, shared with TDmonthly. 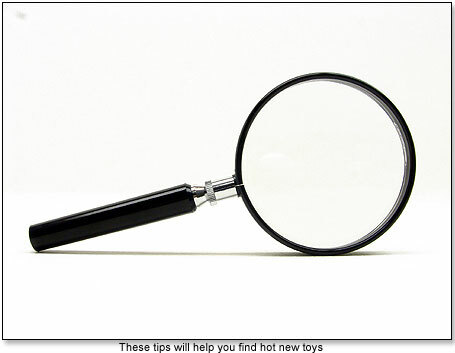 Are you anxious to find new toys, but don't know where to start? Then stop by and take a look at the most recent New Toys we've added to our site. •GameStop – can they build a bridge before they hit the abyss? •Why We Go To Toy Fair - Or Stay Home!